This is a project guide that contains information on how to create landscaping weed block with plastic. We can help you decide what the best kind of plastic is for your garden. If you already know what you are looking for and are ready to purchase, head to our webstore using the 'To Webstore' button above. There are two primary methods for plastic weed barriers in the garden. One is to use woven landscaping plastic sheeting, which allows water to permeate through but prevents weeds from growing. 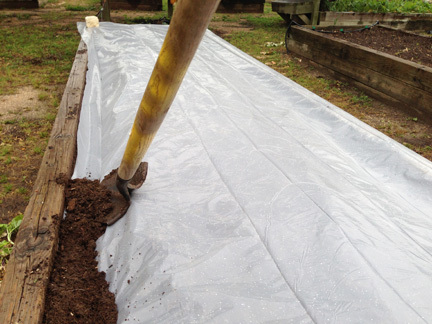 The other is to use standard black plastic sheeting, which creates a solid barrier that completely blocks weeds as well as water. This is best used for low water xeriscaping, soil solarization, or a plant-less installation covered with rocks, gravel, or permenant mulch. There are pros and cons to each method. Let's take a look at each one. This is what most people are referring to when they use the term 'landscaping fabric.' It is manufactured from strong polyethylene fibers that are woven together in a tight bond. This allows water to seep through, but prevents weeds from receiving sun or pushing up from below. It limits the use of herbicides for weeds and reduces evaporation from the soil, keeping it moist for longer periods of time and lessening the need for watering. In any 'normal' planter full of water-loving plants, this is the plastic weed barrier that should be used. The breathable, permeable plastic will keep existing plants healthy. Because it is intended to be left in place for a long period of time, it is not recommended for vegetable gardens or annual flower beds that change plantings often. 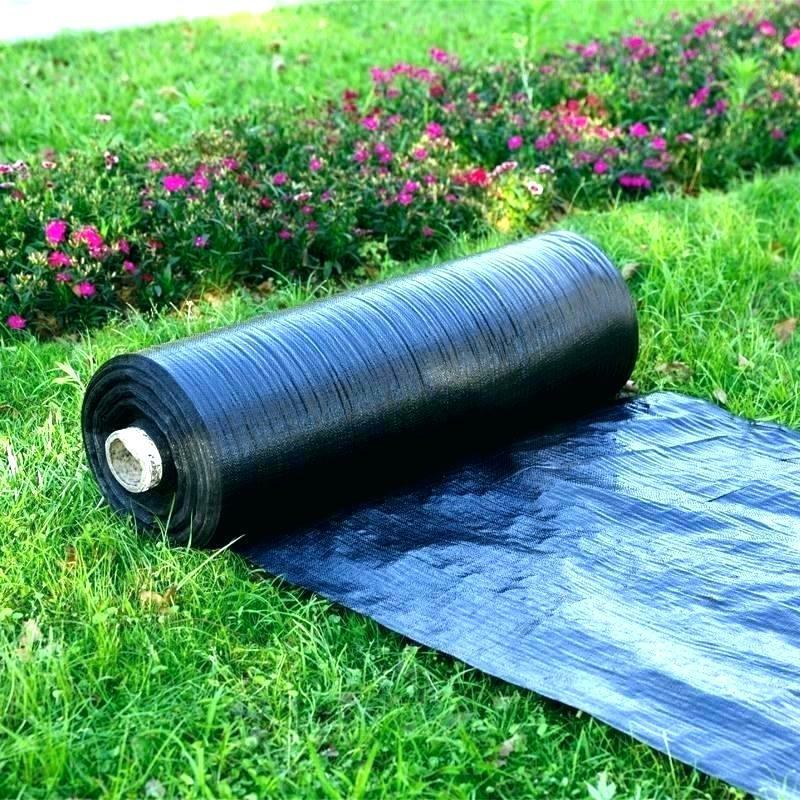 For this type of traditional weed barrier, we recommend our 6 mil black woven plastic or our 6 mil clear woven plastic, depending on the color of your installation. There are many reasons you may want to use a solid barrier in the garden. Farms often use the process of soil solarization in order to prepare soil for planting. In solarization, a solid clear or black barrier is placed over the desired area. It blocks out all water, photosynthesis, and even gas exchange. This deprivation combined with the sunlight heating up the plastic eradicates weeds, pests such as nemotodes and insect eggs, and even harmful bacteria. When planting time comes, the purified soil is mixed with fertilizers to infuse nutrients. Backyard gardeners may want to use the same process in order to fully destroy aggressive rhizome weeds like Bishop's Weed, pests, or harmful bacteria. Solid weed barriers can also be used in xeriscaping (using only low-water plants and mulch to conserve resources and cut down on maintanence) by cutting around existing plantings or cutting to make room for new ones. 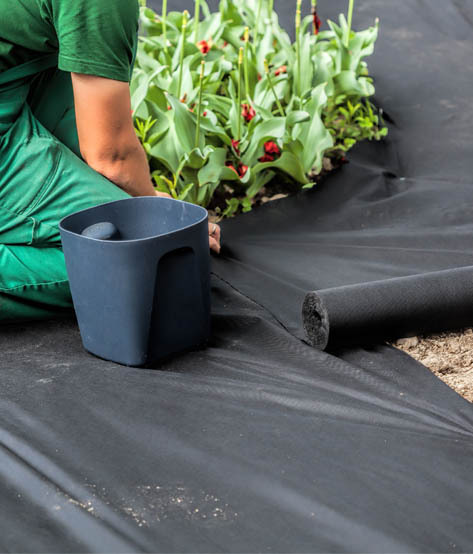 For this, we recommend clear sheeting rather than black, as the black sheeting may heat up the soil too much and destroy the roots of your low-water plants. Lastly, impermeable plastic is also the best choice for zero plant installations that will be filled with rock, gravel, or mulch. This can be a garden pathway, a minimalistic rock garden, or as a highlighting contrast around a large plant such as a tree. For these methods, we suggest 6 mil plastic. It is relatively thick and will create a strong barrier to block all weeds. If you are looking for the most permanant and durable long-term solution, you may want to upgrade to 10 mil. We have both 6 and 10 mil available in either clear or black; whichever is better for the visual of your installation. 1. Remove any plants or weeds growing where the weed barrier will be placed. Also remove any sticks, twigs or rocks that might tear the weed barrier. Any tears in the weed barrier will allow weeds to grow through. 2. Cut the weed barrier in pieces to fit your space and place the weed barrier on the ground. Overlap pieces by about six inches. Use rocks to hold the plastic down during the installation process. Once all the weed barrier has been properly placed, attach it to the ground using landscape pins, stakes, or anchors. Ideally, you should use landscape pins and place them 8-10 inches apart, paying extra care to the edges of your landscape fabric. You want this to last for years; better too many landscape pins than not enough. 3. Cover the weed barrier with mulch or stone. The choice of weed-barrier cover is usually based on cost, availability and aesthetics. Some weeds may sprout in organic mulch, but the amount is minimal compared to the growth in open soil. If you want absolutely zero chance of weeds, use a non-organic mulch such as rocks, gravel, or rubber mulch. Additional Tip: You can also place black plastic sheeting down before laying bricks, pavers or other materials for walkways or patios. This will prevent weeds from growing up between the bricks.